EATING healthy while satisfying your tastebuds at the same time is no easy task, as most of us would have learnt by now. That though, doesn’t mean you should load up on junk food in between mealtimes. We take a look at five yummy guilt-free snack suggestions that are not only low in calories, they’re also sure to keep hunger pangs at bay. 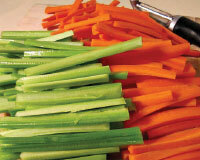 Easy to prepare and easy on the pocket; carrots and celery make crunchy in-between-meal snacks. To prepare this, simply wash and peel (optional) a medium-sized carrot and celery, and slice them into your desired shape and length. If you’re not one for counting calories, why not add a dip to go with them? From salsa to guacamole to plain ol’ mayonnaise, you can go adventurous with your dip. Here’s a snack everyone should go nuts about. These bite-sized munchies are said to be packed with omega-3 fatty acids, fibre and protein — in other words, “good fat”. Each type of nut contains various different health benefits and will fill up your tummy as well as provide your body with essential nutrients. Your best options would be almonds, walnuts and cashews as they’re not only extremely vitality-boosting, they’re easily available as well. For instance, almonds are rich in Vitamin E which is said to give a glow to your skin. Opt out of peeling the skin if you can, as it’s enriched with “flavonoids” that are good for your heart. Walnuts, on the other hand, contain plenty of antioxidants which studies have proven have cancer-fighting properties. Also stock up on Brazil nuts, pistachios and pecans if you want to try something different. Most importantly, avoid nuts that have been coated in oil or sugar, as nuts are best consumed raw. Add a pop of colour to your daily snack in the form of fruits. From berries to mangoes, apples and bananas, fruits are an inexpensive and convenient form of snacks. And while it can’t be substituted as a meal, it’s extremely nutritious satisfying. Grapes and strawberries or blueberries are great for quick and juicy on-the-go bites, or if you love a tangy, citrus flavour; grab a kiwi or an apple. Not only can they be counted as your daily intake of fruits, they double up as breath-fresheners as well. Plus, since they contain fructose — a natural form of sugar — you can satisfy your sweet tooth the healthy way. As you’ve probably heard before, anything that contains whole grain — be it rice, bread or pasta — is a much healthier option than refined foods. The same goes for wholegrain crackers or wholegrain biscuits. It is rich in fibre which helps prevent diabetes, heart disease and even cancer, as some studies have shown. It also helps improve your digestive health; hence why many brands of wholegrain crackers are called “digestives”. As fibre is great at keeping your tummy full for a longer period of time, you’re most likely to eat less — great for those looking to lose weight. If you don’t like the taste of the crackers as they are, try having them with cheese, or a favourite dip (maybe some left from the carrot and celery?). Whether or not it counts as a healthy snack, who’s going to say no to chocolate? 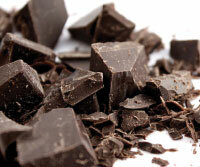 Though if you’re going to enjoy this sinfully-delightful goodness without feeling guilty, go for dark chocolate. This essentially means it contains more cocoa and less sugar and additives than milk chocolate, or white chocolate — which contains no cocoa at all. Another plus point? It is said that dark chocolate triggers your brain to release endorphins, or “happy chemicals” which is sure to put you in a good mood to get past the weekday blues.